The challenges companies face in implementing CSR and sustainability have not diminished. That’s why we’ve stepped up our efforts to create additional CSR capabilities in 2018 – and we’re pleased to have been awarded for it. 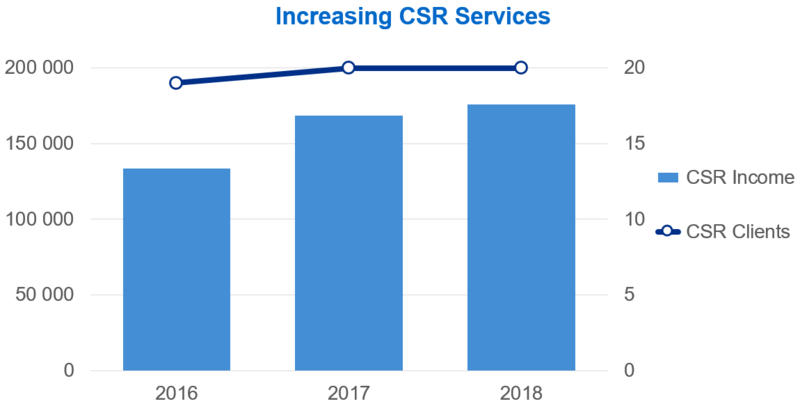 In 2018, we provided a wide range of CSR / sustainability services to 20 organizations. The fee income in this area increased from EUR 168 349 to 175 771, which is now 32% of the total revenue. The focus was on non-financial reporting and the further integration of CSR into corporate strategy and business processes. Apart from consulting, our efforts included additional education projects at universities as well as various initiatives for the professionalization of the CSR practice. Last year, the number of students in our courses increased from 131 to 236. Our lectures covered the topics CSR management, strategy development, stakeholder management and SDG integration. To raise the level of CSR practice, we advocated improvements of the German-language GRI standard and were able to reach more precise formulations for key indicators. In addition, we have taken various measures to make the principle of materiality, in particular the materiality analysis, more understandable and to improve its application in practice, i.e. with a seminar in Croatia and a webinar in Austria. 2018 brought us two significant recognitions: H&P was awarded “SHINE” award in the category of SME, for advocacy and quality communication of CSR in our own digital channels. Additionally, at the CSR conference we received a special recognition for years-long participation in CSR Index. We also participated with a chapter on non-financial reporting in a book “Good Croatia” presenting best case studies in CSR. We continued our cooperation with Croatian Business Council for Sustainable Development and Croatian Chamber of Economy in co-organizing CSR conference at which we moderated a panel on non-financial reporting and one expert section. 2018, we continued to measure our own impact on the economy, society and the environment with assumptions about the impact of our client work made by the account teams. According to this evaluation, with more than 70% of our accounts we contribute positively to the economy and the society, but only 40% have a positive impact on the environment. In order to improve the possibilities for measuring the effects of sustainability, we set up a working group in Austria in 2018. Together with six leading companies, we identify and develop metrics to improve the measurement of the sustainable development goals. First results are expected for 2019. An additional benchmark for our CSR management is the Croatian CSR Index. The latest results show a solid continuation of performance in all areas, having scored 35 points more than the previous year. Since the overall results are calculated related to the total performance of participating companies, the benchmarks are raised every year. 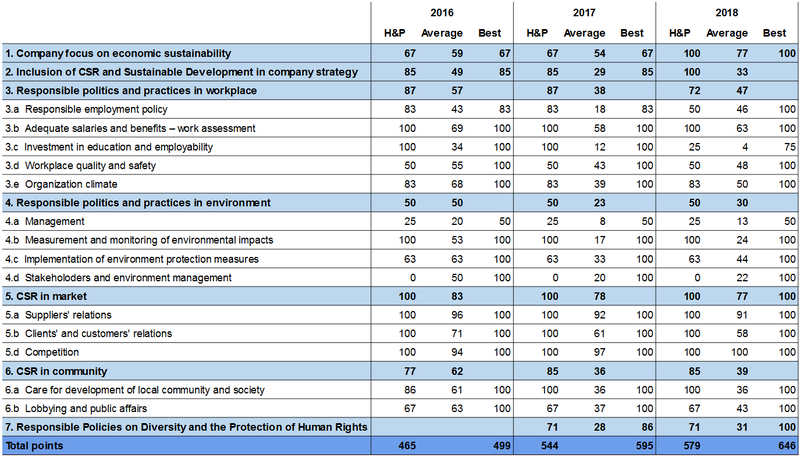 We have raised the score of inclusion of CSR and Sustainable Development in company strategy to the maximum 100 points. To further promote the professionalization of CSR, we will continue our extensive training and education activities in 2019 with lectures at universities and workshops for our clients. As an additional focus, we will set up an online learning platform for CSR. The Hauska & Partner Group will also invest in the set-up of an NPO dedicated to developing new instruments and tools for CSR management.